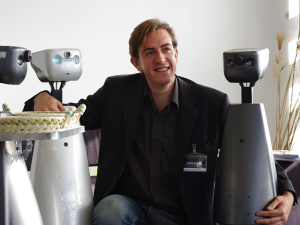 Last week, I had the chance to connect with Jean-Christophe (JC) Baillie, CEO and Founder of GOSTAI and the maker of Jazz, their telepresence robot. In our conversation, JC told me a bit of his history with starting GOSTAI and what he foresees as the future of robotics – how these “teleportation”” systems could be the first real success in robotics beyond vacuum cleaners. JC did his PhD at the Sony Computer Science Lab in Paris, together with the University of Paris, where he first met the Sony Aibo. After his doctorate, he built a lab in Paris at the ENSTA/ParisTech focusing on developmental robotics, and more precisely the emergence of language between robots. During his research, JC had to craft his own OS for controlling the Aibo which was at the center of his research efforts. As he began to show his work and talk about his OS (Urbi), he found that there was a need for a shared OS for building functionality on top of other hardware platforms – and decided to build a company around it. Today, GOSTAI now has about 20 staff and has extended its product offering to include a visual programming Robot IDE called Gostai Studio, and a robotics cloud computing infrastructure called GostaiNet to remotely handle heavy computational tasks that most robot processors are not addressing due to power or component constraints. Why Jazz and Why now? As JC and his team was working with other hardware manufacturers (right now Urbi is on 15 different robotic platforms), he realized that there was a need for a standardized hardware and software platform for people to develop on. So, since his team had built some level of expertise in designing the OS to work with different platforms, GOSTAI decided to create their own. As he looked across the robotics landscape, he saw plenty of B2B applications for robotics – which only lead to building tens or hundreds of the same systems – not enough to drive down the hardware/manufacturing cost to bring robotics to the home. So, leveraging their experiences in user experience on the pilot interface and the understanding they have had with the other systems, they set out to design Jazz. As I mentioned earlier, JC saw that telepresence was the most interesting application. One of his first efforts in building systems from scratch was a telepresence system for the City of Science and Industry museum, allowing people to signup and traverse the museum in a basic mobile telepresence system. You can see videos of the system here and watch this one video for how it was covered. Since the FES effort, Jazz was a simple step up – leveraging the same base, the Urbi OS and the navigation controls. JC says that the Jazz is targeting three market areas: telepresence, tele-surveillance and overall robotic “coolness”. As mentioned in a number of articles, the Jazz is being sold as a telepresence robot system – allowing for communication between the pilot and the participants as seen in this video; as a surveillance solution for stores and other security needs, and then as a marketing tool to allow for “coolness factor” to be added to trade shows (kind of like a high-tech “booth babe” play). 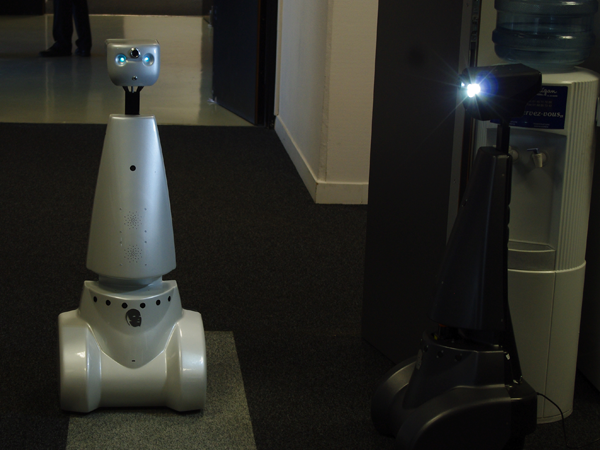 As a telepresence robot system, JC sees the system focusing on companies with more than 50 employees to cut down on travel expenses, improve security and so on. He was thrilled to see iRobot showing the AVA this past week at CES – further validating the potential market for telepresence robots, a market that is far from saturated. What makes the Jazz better than the other systems? JC said the Jazz focuses on “user experience” but not solely in the manner of the UI. For example, to navigate the Jazz, the keyboard and the onscreen controls can manipulate the Jazz around a room, but far too often the commands can overshoot the desired action and frustrate the pilot. The Jazz includes a google Street Map concept where a pilot can select a place on the map and the Jazz will easily move to that physical location on the map (much like how the MantaroBot and the AVA offers to navigate). In testing this mode of navigation with non-technical people, the frustration level with the users went down tremendously. He also speaks of user experience in the sense of how the Jazz connects with the participants – pointing out how the two lit LEDs on the Jazz “face” provide points of reference as if they were eyes on the face of the Jazz. While the camera is located in the central point of the “head”, the LEDs help the participants engage the pilot in a more natural fashion. In addition, the head movements more accurate mimic a natural turning to “look” at a participant, which further engages the conversation and makes it feel more natural. JC says that participants begin to see the person as the Jazz. When the pilot identifies themself in the Jazz – the participants begin to naturally attune themselves to act like the Jazz is the pilot. JC spoke of providing a visual representation of the pilot on the head of the Jazz, to be ready for the upcoming Inno-Robo conference in Lyon in March – promising a display size comparable to the QB’s LED screen. Further innovations are also in store, but he was not ready to share them – he promises another unveiling in May. Is the Jazz a Teleportation System? JC and I spoke a little on defining the space that consists of the Jazz, the QA, the vGo and so on. He assets (like many others in the space) that “telepresence” has become an overused work that generates thoughts of CISCO and video conferencing. And the idea of a “telepresence robot” brings far too much mental baggage of what a “robot” might be (albeit the Terminator, Wall-E, Rosie, Number-5, etc) which can complicate adoption of the systems. He liked the framing of “remote presence systems”, but felt it did not “inspire the imagination”. Specifically, when growing a market, we want to cause people to hear something that they can dream about, see a vision for. JC proposes the “teleportation” definition, since the pilot is “teleported” into another location via the system, but acknowledges the challenge that this definition carries too much of the Star Trek mantra. In selling the Jazz and other systems to customers, he believes that purchasers are buying a piece of the future. In doing so, they are demonstrating to themselves and to others that they are pioneers – making this market more real and less sci-fi. But, until someone has a better, more engaging term – he likes likening Jazz to the transporter in his conversations. And as a dreamer, it is a great idea. This entry was posted in GOSTAI, Jazz Connect, Remote Presence Systems, RPS Companies and tagged GOSTAI, Jazz, Jean-Christophe Baille, remote presence system, teleportation, telepresence robot. Bookmark the permalink.